Picked up at Saint Vincent De Paul the day I was out junking with Laura from Our Prairie Home. The lady said they had come out of a hotel, which I had suspected might have been the case. Kind of wish I had snagged more than just four! 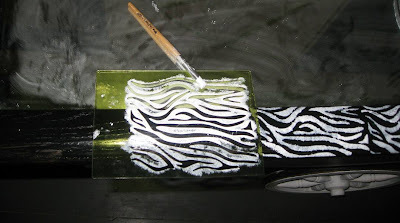 I painted the frame of one of them black, and then using this TINY little zebra stencil, I started the tedious task of covering the entire frame with the striped pattern. Shoulda just gone with the zebra duct tape!! Finished product! Too bad it's so obvious in places where the stencil starts and stops but hey. I wasn't feeling like a perfectionista that day. What shall I do with the next mirror? There are three more! Have a Trash 2 Treasure? Share it! There's a party every Tuesday on the Korner! And have you entered the giveaway from Kit and Caboodle yet? Click HERE to get entered! But, we'll be bloggy friends and who knows...maybe someday one of us will be traveling. Hope you had a wonderful, love filled Valentine's Day Kammy! I love it!! Fun and funky!